How to Plan AheadChoose the right hardscape. 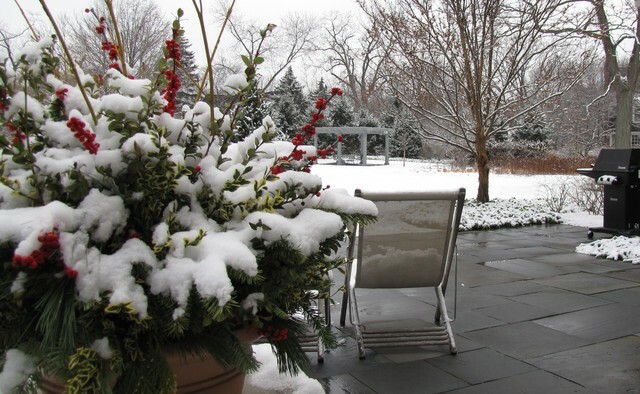 Think about winter safety when designing or renovating your home’s hardscape. For active traffic areas, keep paving surfaces even and with a bit of texture. Think brushed concrete, large slabs of natural stone (shown) or landscape pavers (which are not as slick as house brick). HARD SURFACE IN GARDEN Choose the right hardscape. Think about winter safety when designing or renovating your home’s hardscape. For active traffic areas, keep paving surfaces even and with a bit of texture. Think brushed concrete, large slabs of natural stone (shown) or landscape pavers (which are not as slick as house brick).